CD4+ T cells are critical for the control of virus infections, T cell memory, and immune surveillance. We studied the differentiation and function of murine γ-herpesvirus 68 (MHV-68)–specific CD4+ T cells using gp150-specific TCR-transgenic mice. This allowed a more detailed study of the characteristics of the CD4+ T cell response than did previously available approaches for this virus. Most gp150-specific CD4+ T cells expressed T-bet and produced IFN-γ, indicating that MHV-68 infection triggered differentiation of CD4+ T cells largely into the Th1 subset, whereas some became follicular Th cells and Foxp3+ regulatory T cells. These CD4+ T cells were protective against MHV-68 infection in the absence of CD8+ T cells and B cells, and protection depended on IFN-γ secretion. Marked heterogeneity was observed in the CD4+ T cells, based on lymphocyte Ag 6C (Ly6C) expression. Ly6C expression positively correlated with IFN-γ, TNF-α, and granzyme B production; T-bet and KLRG1 expression; proliferation; and CD4+ T cell–mediated cytotoxicity. Ly6C expression inversely correlated with survival, CCR7 expression, and secondary expansion potential. Ly6C+ and Ly6C− gp150-specific CD4+ T cells were able to interconvert in a bidirectional manner upon secondary Ag exposure in vivo. These results indicate that Ly6C expression is closely associated with antiviral activity in effector CD4+ T cells but is inversely correlated with memory potential. Interconversion between Ly6C+ and Ly6C− cells may maintain a balance between the two Ag-specific CD4+ T cell populations during MHV-68 infection. These findings have significant implications for Ly6C as a surface marker to distinguish functionally distinct CD4+ T cells during persistent virus infection. Adaptive immunity to viral infections relies on neutralizing Abs, antiviral activity of CD8+ T cells, and CD4+ T cell help. EBV (1) and Kaposi’s sarcoma–associated herpesvirus (KSHV) (2) are two γ-herpesviruses that infect humans and are closely associated with the development of malignancies (3). Malignancies associated with EBV and KSHV are commonly found in HIV-infected patients owing to disruption of T cell surveillance (4). Murine γ-herpesvirus 68 (MHV-68) is a naturally occurring rodent pathogen (5) that provides an important model to explore γ-herpesvirus infections and immunity (6–10). Mice lacking CD4+ T cells lose long-term control of MHV-68 infection (11–13), and CD4+ T cells are also thought to contribute to immunity to MHV-68 by more direct mechanisms (14, 15). CD4+ T cells differentiate into various effector cell types depending on the identity of the pathogen, Ag characteristics, and inflammatory cytokines. The well-known subsets of CD4+ T cells include Th1, Th2, Th17, follicular Th (TFH), and regulatory T cells (Tregs) (16). CD4+ Th cells are important for the induction and maintenance of effective humoral immunity (17) and CD8+ T cell responses (18). CD4+ T cells also contribute to the antiviral response by production of cytokines, such as IL-2 and IFN-γ (14, 19). In addition to being helpers and regulators in antiviral immunity, effector CD4+ T cells can directly kill infected cells; these cells are termed cytolytic CD4+ T cells or CD4+ CTLs (20). Master transcription factors regulate distinct fates of Ag-specific CD4+ T cells during viral infection, and T-bet, GATA3, RORγt, Bcl6, eomesodermin (eomes), and Foxp3 can drive CD4+ T cell lineage differentiation into Th1 cells, Th2 cells, Th17 cells, TFH cells, CTLs, and Tregs, respectively (16). Upon first Ag encounter, naive CD8+ T cells become activated, expand, and develop into short-lived effector cells (SLECs) or memory precursor effector cells (MPECs) (21). SLECs are more terminally differentiated effector cells that confer immediate protection and decline following Ag clearance. In contrast, MPECs have the ability to respond to survival signals and develop into memory cells. Memory cells are composed of at least two functionally distinct subsets: effector memory T (TEM) cells and central memory T (TCM) cells (22). TEM cells can migrate to inflamed tissues and display immediate effector function, but they proliferate poorly in response to Ag. In contrast, TCM cells mainly home to lymphoid organs and vigorously re-expand upon Ag re-encounter, but they lack immediate effector function. However, unlike CD8+ T cells, CD4+ T cell differentiation is less well characterized. Lymphocyte Ag 6C (Ly6C) and P-selectin glycoprotein ligand-1 (PSGL1) are considered surface markers to distinguish subsets of CD4+ T cells in acute lymphocytic choriomeningitis virus (LCMV) infection (23). Ly6ChiPSGL1hi cells have a more terminally differentiated Th1 phenotype; Ly6CloPSGL1hi cells are Th1 cells that have more potential to become memory cells; and Ly6CloPSGL1lo identifies TFH cells. However, the identity of the virus infection can have a marked impact on many aspects of T cell differentiation. These range from altered distribution among phenotypic subsets to altered differentiation kinetics to T cell exhaustion. Therefore, it is important to determine whether this model holds true for diverse virus infections. This is particularly true for persistent, reactivating infections, such as those of the herpesvirus family, where Ag exposure is chronic yet sporadic. MHV-68 initially replicates in the lung after intranasal (i.n.) infection and then establishes lifelong latency, primarily in B cells (24), but also in dendritic cells, macrophages (25), and lung epithelial cells (26). CD4+ T cells control MHV-68 infection, not only by providing help for CD8+ T cell responses (11), but also through IFN-γ production (14) and direct cytotoxicity (15). It was shown that OVA-specific CD4+ T cells have B cell– and CD8+ T cell–independent antiviral functions in the control of MHV-68 infection (27). However, this was in the context of a virus expressing the strong exogenous Ag OVA, and it is not clear whether the same is true for CD4+ T cell responses directed toward endogenous viral epitopes. Prior studies showed that persistent MHV-68 infection can induce two effector populations: IFN-γ producers and CD107+ cytolytic effectors (28). Recently, multiple CD4+ T cell epitopes were identified in MHV-68 lytic and latent proteins (29). However, detailed functional characteristics, lineage identity, and subset distribution within the antiviral CD4+ T cell responses have not been elucidated at a cellular level. Recently, we generated a TCR-transgenic mouse with specificity for the MHV-68 gp15067–83/I-Ab epitope (30). The gp15067–83 peptide is an MHC class II–restricted epitope, and activation of gp150-specific CD4+ T cells was confirmed during acute and latent infections. The gp150-specific TCR-transgenic (gp150-Tg) mouse provides a powerful model for dissecting the development and antiviral function of MHV-68–specific CD4+ T cells. There are 20–200 naive CD4+ T cells for a specific antigenic epitope in the mouse T cell pool (31). The low precursor frequency, functional heterogeneity, and paucity of usable MHC class II tetramers (32) are great barriers to the study of CD4+ T cells, especially for characterizing the CD4+ T cell response to a specific viral Ag. In this study, using the gp150-Tg mouse model, we characterized the differentiation, phenotype, and antiviral function of virus-specific CD4+ T cells in detail. Our study demonstrates that the CD4+ T cell response directed toward the endogenous gp150 epitope can protect against virus infection independently of CD8+ T cells and B cells. The response in vivo was markedly heterogeneous and divisible by differential Ly6C expression. Antiviral Th1 effector functions were mostly present in the Ly6C+ population, whereas the Ly6C− population had the hallmarks of memory cells. Bidirectional interconversion between these populations was observed, suggesting that the division of labor within the antiviral CD4+ T cell response is dynamically regulated during infection. C57BL/6 (B6) and B6Ly5.2 mice were purchased from the National Cancer Institute (Bethesda, MD). CD45.2+ MHV-68 gp15067–83I-Ab–specific TCR-transgenic mice on the RAG−/− background were provided by M.A.B. (30). Mice were maintained under specific pathogen–free conditions in the Dartmouth Center for Comparative Medicine and Research. The Animal Care and Use Committee of Dartmouth College approved all animal experiments. We obtained CD45.1+ gp150-specific TCR-transgenic (gp150-Tg) mice by breeding the CD45.2+-transgenic mouse to B6Ly5.2 (CD45.1+) and selecting mice with all CD4+ T cells expressing Vα11 and Vβ12. To generate gp150-specific CD4+ T cell adoptively transferred (gp150-transferred) mice, gp150-specific CD4+ T cells (CD45.1+) were prepared from the splenocytes of naive gp150-Tg mice using an EasySep Mouse CD4+ T Cell enrichment kit (STEMCELL Technologies, Vancouver, BC, Canada). In this study, 104 gp150-specific CD4+ T cells were adoptively transferred i.v. into naive B6 (CD45.2+) mice, unless otherwise noted, which is consistent with the recommended numbers from previous studies (33). MHV-68 clone G2.4 was obtained from Dr. A.A. Nash (University of Edinburgh, Edinburgh, U.K.). MHV-68 FS73R and FS73 were obtained from Dr. S. Efstathiou (University of Cambridge, Cambridge, U.K.). The viral strains were propagated and titered using NIH 3T3 cells, as previously described (34). ORF73 of MHV-68 encodes mLANA, a homologous protein to KSHV LANA (35) that is involved in the establishment and maintenance of latency (36). MHV-68 FS73 is a mutant virus with a frameshift in the ORF73 gene; it is unable to establish latency, although it replicates normally during the acute phase of the infection. MHV-68 FS73R is a revertant virus with the frameshift repaired; it has similar replication kinetics in vitro and in vivo as wild-type strains (36). Mice were infected i.n. with 4000 PFU MHV-68 under anesthesia with isoflurane. MHV-68 G2.4 was used unless otherwise noted. In gp150-transferred mice, infection was performed 1 d after cell transfer. Virus titers in the lungs were measured by a plaque-forming assay, as previously described (37). Mice were euthanized when body weight decreased to 75% of the original weight. To deplete CD4+ T cells, mice were administered 500 μg anti-CD4 Ab (GK1.5) i.p. at days −1 and 0 postinfection (p.i. ), followed by 250 μg twice weekly thereafter until sacrifice. To block IFN-γ signaling, mice were given 1 mg IFN-γ–blocking Ab (R4-6A2; Bio X Cell, West Lebanon, NH) i.p. at days −1 and 0 postchallenge and then 500 μg every other day after infection until sacrifice. Control mice were either left untreated or given rat IgG (Jackson ImmunoResearch, West Grove, PA). Splenocytes were prepared by passing spleens through cell strainers, and RBCs were lysed using Gey’s solution. Lungs were digested with collagenase (2.33 mg/ml; Sigma-Aldrich, Milwaukee, WI) and DNase (0.2 mg/ml; Roche Diagnostics, Indianapolis, IN) for 30 min. Abs for flow cytometric analysis were purchased from eBioscience or BioLegend (San Diego, CA) unless otherwise noted: CD4–allophycocyanin–eFluor 780 (GK1.5), CD44-FITC (IM7), CD45.1-allophycocyanin (A20), Ly6C-PEcy7 (HK1.4), CXCR5 purified (2G8), killer cell lectin-like receptor G1 (KLRG1)-PE (2F1 KLRG1), CD127-FITC (SB/199), CD122-PE (TM-b1), PD-1–FITC and allophycocyanin (RMP1-30), CCR7–Alexa Fluor 488 (4B12), CD62L-FITC (MEL-14), IFN-γ–FITC and PerCP-Cy5.5 (XMG1.2), TNF-α–FITC (MP6-XT22), IL-2–PE (JES6-5H4), granzyme B (GzmB)-PE (GB12; Invitrogen, Carlsbad, CA), T-bet–Alexa Fluor 488 (4B10; Santa Cruz Biotechnology, Santa Cruz, CA), GATA3-PE (TWAJ), RORγt-allophycocyanin (AFKJS-9), Bcl6–Alexa Fluor 647 (K112-91; BD Biosciences, San Jose, CA), eomes PE (Dan11mag), Foxp3-FITC (FJK-16s), biotin-conjugated Affinipure goat anti-rat IgG (H+L) (Jackson ImmunoResearch), and streptavidin-PE. Samples were analyzed using MACSQuant in the DartLab core facility (Dartmouth College) or Accuri flow cytometers. Data were analyzed using FlowJo software (TreeStar, Ashland, OR) or Accuri software (BD Biosciences). Surface markers on cells were stained with Abs in PBS with 2% bovine growth serum (FACS buffer) at 4°C for 20 min. TFH cells were stained with purified CXCR5 for 1 h in FACS buffer + 0.5% BSA + 2% normal mouse serum (NMS), followed by biotin-goat anti-rat IgG for 30 min in FACS buffer + 2% NMS, and then streptavidin and other surface-staining Abs for 30 min in FACS buffer + 2% NMS at 4°C. For intracellular cytokine/molecule detection, splenocytes were restimulated ex vivo with 2.5 μg/ml gp15067–83 peptide (LSNNNPTTIMRPPVAQN) or 50 ng/ml PMA and 1 μg/ml ionomycin calcium salt from Streptomyces conglobatus in complete medium with 10 U/ml rIL-2 and 10 μg/ml brefeldin A (all from Sigma-Aldrich) at 37°C for 5 h. Subsequently, cells were stained with Abs against surface markers for 20 min at 4°C, fixed with 1% formaldehyde at 4°C for 20 min, and stained with Abs against IFN-γ, TNF-α, IL-2, or GzmB in 0.5% saponin solution at 4°C for 30 min. A Foxp3/Transcription Factor Staining Buffer Set (eBioscience) was used for transcription factor detection. Cell proliferation in vivo was measured by 5-ethynyl-2′-deoxyuridine (EdU) incorporation into DNA. gp150-transferred mice that were infected with MHV-68 for 14 d were injected i.p. with 1 mg EdU. Splenocytes were prepared 16 h later, and cells were stained with anti-CD4, anti-CD45.1, and anti-Ly6C Abs, and EdU was detected using a Click-iT Plus EdU Flow Cytometry Assay Kit (Molecular Probes, Carlsbad, CA), following the manufacturer’s protocol. A total of 1 × 104 gp150-specific naive CD4+ T cells was adoptively transferred i.v. into B6 mice 1 day prior to MHV-68 infection. Twelve days later, splenocytes were prepared and stained with anti-CD4, anti-CD45.1, and anti-Ly6C Abs, and Ly6C+ and Ly6C− gp150-specific CD4+ (CD45.1+) T cells were sorted using a FACSAria cell sorter. Subsequently, 3 × 104 Ly6C+ or Ly6C− gp150-specific effector cells were adoptively transferred into naive B6 mice. One day later, the mice were infected with MHV-68. At day 8 p.i., splenocytes were prepared and stained with anti-CD4, anti-CD45.1, and anti-Ly6C Abs and analyzed by flow cytometry. Splenocytes were prepared from gp150-transferred mice that had been infected with MHV-68 for 15 d. Cells were stained with anti-CD4, anti-CD45.1, and anti-Ly6C Abs and annexin V using an Apoptosis Detection Kit (BD Biosciences). The apoptosis of Ly6C+ and Ly6C− CD45.1+CD4+ T cells was analyzed by flow cytometry. For in vivo cytotoxicity assay, splenocytes were prepared from B6 mice and incubated with 2.5μg/ml gp150 peptide in complete medium at 37°C for 1 h. The gp150-pulsed and unpulsed splenocytes were labeled with 3 or 0.3 μM CFSE, respectively, in HBSS at room temperature for 10 min. The gp150-pulsed (CFSEhi) and unpulsed (CFSElo) cells were mixed at a 1:1 ratio and used as target cells. A total of 5 × 106 target cells was injected i.v. into MHV-68–infected gp150-Tg mice (at day 13 p.i.) or naive gp150-Tg mice, and mice were sacrificed 20 or 40 h later. Splenocytes were prepared and stained with 10 μM 7-aminoactinomycin D (BD Biosciences) at room temperature for 15 min. CFSE+ target cells were analyzed by flow cytometry. Specific lysis was quantitated with the percentage of specific killing, which was calculated according to the following formula: % specific lysis = (1 − [ratio of infected recipients/ratio of naive recipients]) × 100%, where ratio = number of CFSEhi/number of CFSElo. For ex vivo cytotoxicity assays, 2 × 104 gp150-specific CD4+ T cells were adoptively transferred into B6 mice, and mice were infected with MHV-68 for 13 d. Splenocytes were stained with anti-CD4, anti-CD45.1, and anti-Ly6C Abs and sorted by FACS for Ly6C+ and Ly6C− CD45.1+CD4+ T cells. Ly6C+ or Ly6C− CD4+ T cells were cultured with target cells at an E:T ratio of 6:1 in complete media in 96-well plates at 37°C for 40 h. Cells were stained with 10 μM 7-aminoactinomycin D at room temperature for 15 min, and CFSE+ target cells were analyzed by flow cytometry. Specific lysis was calculated based on the following formula: % specific lysis = (1 − [ratio of Ly6C+ or Ly6C− CD4+ group/ratio of target alone group]) × 100%, where ratio = number of CFSEhi/number of CFSElo. Statistical differences were determined using Student t tests (two-tailed, unpaired), with the exception of the survival curve (log-rank analysis), using GraphPad Prism 5 software (GraphPad, La Jolla, CA). We first determined the kinetics of the gp150-specific CD4+ T cell response in gp150-transferred mice. Mice were infected with one of two MHV-68 strains: revertant FS73R or mutant FS73 virus, which can or cannot establish latency, respectively (36, 38). Comparison of FS73R and FS73 infection allowed us to elucidate the effect of persistent infection on the CD4+ T cell response. Upon FS73R or FS73 infection, the gp150-specific CD4+ T cells expanded and peaked at day 10 p.i. (Fig. 1A), with average frequencies of 0.8–1.9% of CD4+ T cells and total numbers > 105 cells/spleen (Fig. 1B). Similar frequencies of gp150-specific CD4+ T cells were observed in the lung for FS73R and FS73 infection at day 10 p.i. (Supplemental Fig. 1A). We also measured polyclonal CD44+ CD4+ T cell populations. At day 10 p.i., CD44+ T cells represented ∼40% of CD4+ T cells in the spleen and 60% in the lung in both FS73R and FS73 infections (Supplemental Fig. 2A). Over time, the gp150-specific CD4+ T population contracted in both FS73R and FS73 infections (Fig. 1B). It was difficult to reliably detect CD4+ T cell memory populations after day 50 p.i. There was a trend toward higher frequencies and larger total numbers of gp150-specific CD4+ T cells in FS73R-infected mice compared with FS73-infected mice, but in most cases it did not reach statistical significance. These data show that gp150-specific CD4+ T cells expand and are maintained similarly after adoptive transfer during infection with both the persistent and nonpersistent strains of MHV-68. The response peaks during the acute stage of infection and then declines during latent infection. Kinetics of gp150-specific CD4+ T cell responses during MHV-68 FS73R and FS73 infection. gp150-specific CD4+ T cells were prepared from splenocytes of MHV-68 gp150-Tg mice (CD45.1+), and 1 × 104 cells were transferred i.v. into B6 (CD45.2+) mice 1 d prior to FS73R or FS73 infection (i.n.). Spleens were harvested from infected gp150-transferred mice, and splenocytes were stained with anti-CD4 and anti-CD45.1 Abs and analyzed by flow cytometry. (A) Representative FACS plots of gp150-specific CD4+ T cell populations at the indicated time p.i. Plots were gated on CD4+ T cells. The percentage shown is the frequency of CD45.1+ among CD4+ T cells. (B) Frequency of gp150-specific CD4+ T cells among CD4+ T cells and total number of gp150-specific CD4+ T cells in spleen. Data are representative of at least two independent experiments for each time point with four mice/group. Error bars represent SD. *p < 0.05. To test whether there was heterogeneity within the gp150-specific CD4+ T cell population based on surface marker expression, we stained for Ly6C and PSGL1, because it was shown that Th1 cells are Ly6ChiPSGL1hi and TFH cells are Ly6CloPSGL1lo in LCMV infection (23). gp150-transferred mice were infected with MHV-68 FS73R or FS73, and cells from spleen and lung were prepared and stained with anti-CD4, anti-CD45.1, anti-Ly6C, and anti-PSGL1 Abs at different times p.i. We did not observe a distinct PSGL1− population in gp150-specific CD4+ T cells (Supplemental Fig. 3A). Based on Ly6C expression, the gp150-specific CD4+ T cells from splenocytes could be divided clearly into two populations. Ly6C+ and Ly6C− cell populations existed at a ratio of 2:3 at days 10 and 14 p.i. in both FS73R and FS73 infections (Fig. 2A). The gp150-specific CD4+ T cells from the lungs also could be divided clearly into the two populations (Supplemental Fig. 1B). Similarly, Ag-experienced CD44+CD4+ T cells in spleen and lung could be divided into Ly6C+ and Ly6C− populations after FS73R and FS73 infection (Supplemental Fig. 2B). Over time, the Ly6C− cells in the gp150-specific CD4+ cell population became more dominant in FS73R-infected mice, changing to a ratio of 1:4 (Ly6C+/Ly6C−) at day 45 p.i., a difference that was statistically significant (p < 0.05) when day-45 and day-10 values were compared. However, the ratio remained fairly consistent at 2:3 in FS73-infected mice (Fig. 2A). These findings indicate that both FS73R and FS73 infections direct gp150-specific CD4+ T cells into two populations, Ly6C+ and Ly6C−, and the Ly6C− cells are the larger population in the gp150-specific effector CD4+ T cell pool. The altered ratio of Ly6C+/Ly6C− cells at later times p.i. could be due to persistent MHV-68 infection preferentially expanding the Ly6C− population. Two populations of gp150-specific CD4+ T cells based on Ly6C expression. (A) Splenocytes were prepared from infected gp150-transferred mice and stained with anti-CD4, anti-CD45.1, and anti-Ly6C Abs. Representative FACS plots were gated on CD45.1+CD4+ T cells (gp150-specific cells) (left panel). Bar graph shows relative percentage of Ly6C+ and Ly6C− cells within CD45.1+CD4+ T cells (right panel). Data are representative of at least two independent experiments for each time point with four mice/group. (B) Interconversion between Ly6C+ and Ly6C− populations. gp150-specific CD4+ T cells were transferred into B6 mice 1 d prior to infection. At day 12 p.i., splenocytes were prepared from eight spleens, and Ly6C+ and Ly6C− CD45.1+CD4+ T cells were sorted, transferred separately into naive B6 mice (3 × 104 cells/mouse), and infected with MHV-68. At day 8 p.i., splenocytes were stained with anti-CD4, anti-CD45.1, and anti-Ly6C Abs. Representative FACS plots were gated on CD45.1+CD4+ T cells (left panel). Bar graph shows the Ly6C expression conversion of donor cells (right panel). Data are representative of three independent experiments with 3–10 mice/group. Error bars represent SD. Next, we assessed the stability of Ly6C expression on gp150-specific effector CD4+ T cells. gp150-specific effector CD4+ T cells from infected gp150-transferred mice were sorted into Ly6C+ and Ly6C− cells at day 12 p.i. and then transferred separately into naive B6 mice. The purity of sorting was 98.5% for Ly6C+ cells and 99.0% for Ly6C− cells (data not shown). One day posttransfer, mice were infected with MHV-68, and spleens were harvested at day 8 p.i. The transferred effector cells continued to expand and differentiate, and each gave rise to both Ly6C+ and Ly6C− populations; however, the majority of cells retained their original phenotype: Ly6C+ cells differentiated into Ly6C+ and Ly6C− at a ratio of 7:3, and Ly6C− cells differentiated into Ly6C+ and Ly6C− at a ratio of 3:7 (Fig. 2B). The data indicate that both Ly6C+ and Ly6C− cells maintain plasticity to differentiate into the alternate phenotype. To explore the differentiation of Ag-specific CD4+ T cells during MHV-68 infection, we measured the expression of transcriptional master regulators T-bet, GATA3, RORγt, Bcl6, eomes, and Foxp3 in gp150-specific CD4+ T cells. Both Ly6C+ and Ly6C− gp150-specific effector CD4+ T cells from gp150-transferred mice expressed more T-bet than did naive CD4+ T cells, but no difference was observed in the expression of GATA3, RORγt, Bcl6, or eomes between effector and naive CD4+ T cells (Fig. 3A). The positive controls of GATA3, RORγt, Bcl6, or eomes staining compared with naive CD4+ T cells are shown (Supplemental Fig. 3B). 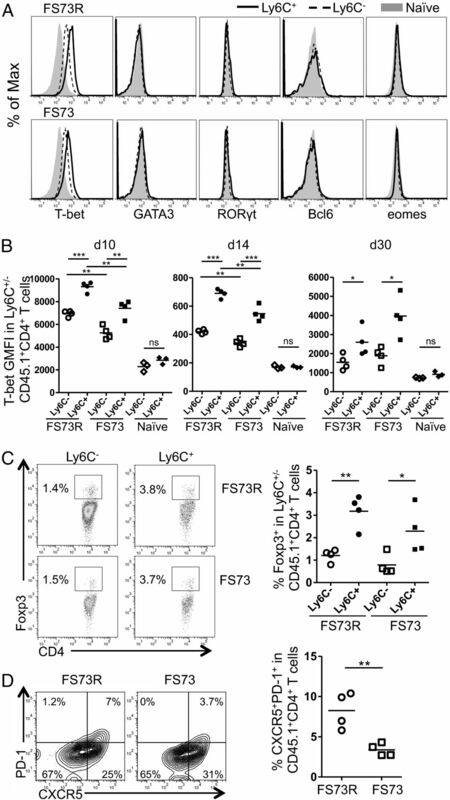 The gp150-specific CD4+ T cells from FS73R-infected mice expressed more T-bet than did those from FS73-infected mice, and Ly6C+ cells expressed significantly more T-bet than did Ly6C− cells (Fig. 3B). In the lungs, gp150-specific Ly6C+CD4+ T cells in FS73R-infected mice also expressed more T-bet (Supplemental Fig. 1C). Similarly, Ly6C+CD44+CD4+ T cells expressed more T-bet than did Ly6C−CD44+CD4+ T cells in FS73R and FS73 infections in both spleen and lung (Supplemental Fig. 2C). A small population of gp150-specific CD4+ T cells expressed Foxp3, and the percentage was higher in the Ly6C+CD4+ T cell population compared with their Ly6C− counterparts at day 14 p.i. (Fig. 3C). Differentiation of gp150-specific CD4+ T cells into Th1 cells, Tregs, and TFH cells. Splenocytes from infected gp150-transferred mice were stained with anti-CD4, anti-CD45.1, anti-Ly6C, anti–transcription factors, anti-CXCR5, and/or anti–PD-1 Abs. (A) Representative FACS graphs for transcription factor expression in Ly6C+ or Ly6C− CD45.1+CD4+ T cells at day 14 p.i. and naive CD4+ T cells from B6 mice. (B) T-bet GMFI in Ly6C+ or Ly6C− CD45.1+CD4+ T cells at the indicated days p.i. and in naive CD4+ T cells. (C) Representative FACS plots of Foxp3 expression (left panel). Plots were gated on Ly6C+ or Ly6C− CD45.1+CD4+ T cells. Graph shows frequency of Foxp3+ cells in Ly6C+ or Ly6C− CD45.1+CD4+ T cells at day 14 p.i. (right panel). (D) Representative FACS plots (left panel) and frequencies (right panel) of CXCR5hiPD-1hi cells within CD45.1+CD4+ T cells at day 15 p.i. Data are representative of at least two independent experiments, with three to four mice/group. *p < 0.05, **p < 0.01, ***p < 0.001. ns, no significance. It was shown in infection with multiple pathogens, including Listeria monocytogenes (39) and MHV-68 (40), that CXCR5hiPD-1hi identifies TFH cells, and we were able to detect TFH cells with these Abs. A low frequency of TFH cells was detected among gp150-specific cells, with higher frequencies of CXCR5hiPD-1hi cells in FS73R infection compared with FS73 infection (8.3 versus 3.7%) (Fig. 3D). Similarly, the frequency of CXCR5hiPD-1hi cells within CD44+CD4+ T cells was higher in FS73R infection than in FS73 infection (13 versus 6.8%) (Supplemental Fig. 2E). These data suggest that most gp150-specific CD4+ T cells differentiate into Th1 cells, but some differentiate into TFH cells and Tregs during MHV-68 infection. To investigate the function of Ag-specific effector CD4+ T cells, we measured effector molecules IFN-γ, TNF-α, IL-2, and GzmB produced by Ly6C+ and Ly6C− gp150-specific effector CD4+ T cells. Splenocytes from MHV-68–infected gp150-transferred mice were restimulated with gp150 peptide (Ag specific stimulation) or PMA/ionomycin (nonspecific stimulation) and then stained intracellularly with Abs against effector molecules. Frequencies of gp150-specific CD4+ T cells producing IFN-γ or TNF-α in the Ly6C+ population were significantly higher than those in their Ly6C− counterparts, regardless of the nature of stimulation (Fig. 4A). Cytokine production was observed from a relatively low frequency of gp150-specific CD4+ T cells following peptide stimulation, and this increased markedly following PMA stimulation. With PMA stimulation, 50 and 45% of Ly6C+ gp150-specific effector CD4+ T cells produced IFN-γ and TNF-α, respectively, whereas the frequencies were 23 and 14% in Ly6C− cells at day 14 p.i. (Fig. 4A, right panels). Although Ly6C+ cells produced more IL-2 than did Ly6C− cells after peptide stimulation, production was from a low percentage of cells, and no difference was observed following PMA stimulation. Ly6C+ gp150-specific CD4+ T cells also produced more GzmB on a per-cell basis, and geometric mean fluorescence intensity (GMFI) was approximately 2-fold higher than in Ly6C− cells (Fig. 4A). In the CD44+CD4+ T cell population, higher frequencies of Ly6C+ cells produced IFN-γ compared with Ly6C− cells (Supplemental Fig. 2D), consistent with data obtained from Ag-specific CD4+ T cells. Further, at the memory phase, Ly6C expression was still associated positively with IFN-γ production (Fig. 4B). Positive correlation between Ly6C expression and IFN-γ, TNF-α, and GzmB production. Splenocytes from infected gp150-transferred mice were restimulated with gp150 peptide or PMA/ionomycin and then stained with anti-CD4, anti-CD45.1, anti-Ly6C, anti–IFN-γ, anti–TNF-α, anti–IL-2, and/or anti-GzmB Abs. FACS plots were gated on Ly6C+ or Ly6C− CD45.1+CD4+ T cells. Production of IFN-γ, TNF-α, and IL-2 is presented as the percentage of positive cells, and production of GzmB is presented as GMFI within Ly6C+ or Ly6C− CD45.1+CD4+ T cells. (A) Production of effector molecules at day 14 p.i. by gp150-specific CD4+ T cells following gp150 peptide (left panel) or PMA (right panels) restimulation. (B) IFN-γ production with PMA restimulation at day 30 p.i. (C) Coproduction of effector cytokines by Ly6C+ or Ly6C− CD45.1+CD4+ T cells with PMA restimulation at day 14 p.i. Pie charts and bar graphs show the proportions of the total response that are positive for three, two, one, or no cytokine within Ly6C+ or Ly6C− CD45.1+CD4+ T cells. All possible combinations of responses are shown on the x-axis of the bar graph. Error bars represent SD. Data are representative of at least two independent experiments with three to five mice/experiment. *p < 0.05, **p < 0.01, ***p < 0.001. To determine whether the gp150-specific CD4+ T cells were polyfunctional, we measured coproduction of cytokines by staining cells with the combinations of anti–IFN-γ, anti–TNF-α, and anti–IL-2 Abs at day 14 p.i. Thirteen percent of Ly6C+ gp150-specific effector CD4+ T cells produced IFN-γ, TNF-α, and IL-2, and 27% produced IFN-γ and TNF-α. In contrast, 6% of Ly6C− cells produced IFN-γ, TNF-α, and IL-2, and 5% produced IFN-γ and TNF-α (Fig. 4C). Notably, in the Ly6C+ population, 43% of the gp150-specific CD4+ T cells did not produce any of the three cytokines, whereas this frequency was 75% in the Ly6C− population (Fig. 4C). The data show that Ly6C+ cells are more polyfunctional than Ly6C− cells during MHV-68 infection. KLRG1 is described as a marker for replicative senescence of murine CD8+ T cells (41). CD127 (IL-7Rα) is a marker to identify memory cell precursors (42). In CD8+ T cells, KLRG1hiCD127lo and KLRG1loCD127hi cells are considered SLECs and MPECs, respectively (43). In CD4+ T cells, more terminally differentiated cells also express more KLRG1 in Mycobacterium tuberculosis infection (44) and higher KLRG1 mRNA in LCMV infection (23). However, unlike CD8+ T cells, CD127 expression is not associated with CD4+ T cell memory potential (23). In this study, we measured KLRG1 and CD127 expression on Ly6C+ and Ly6C− gp150-specific CD4+ T cells in MHV-68 infection. KLRG1 expression was upregulated in the Ly6C+ gp150-specific effector CD4+ T cell population at day 15 p.i. (Fig. 5A). In contrast, the proportion of KLRG1+ cells in the Ly6C− population was similar to that in the naive CD4+ T cell population. CD127 expression on Ly6C+ gp150-specific effector CD4+ T cells was higher than on Ly6C− cells. However, even naive Ly6C+CD4+ T cells had high expression relative to Ly6C− cells. Expression of surface markers on Ly6C+ and Ly6C− gp150-specific CD4+ T cells. Splenocytes from infected gp150-transferred mice were stained with anti-CD4, anti-CD45.1, anti-Ly6C and anti-KLRG1, anti-CD127, anti-CD122, anti-CD44, anti–PD-1, anti-CD62L, or anti-CCR7 Abs. Naive CD4+ T cells were prepared from B6 mice. Graphs show percentage or GMFI of cells expressing the molecule indicated within Ly6C+ or Ly6C− CD45.1+CD4+ T cells. (A) Expression of KLRG1 and CD127 at day 15 p.i. (B) Expression of CD122, CD44, and PD-1 at day 15 p.i. (C) Expression of CD62L at days 15 and 55 p.i. and expression of CCR7 at day 55 p.i. Data are representative of two independent experiments with three to seven mice/experiment. *p < 0.05, **p < 0.01, ***p < 0.001. We also measured the expression of CD122, CD44, and PD-1 on gp150-specific effector CD4+ T cells. Compared with Ly6C− cells, Ly6C+ cells had higher CD122 expression, but no differences were observed in CD44 and PD-1 expression (Fig. 5B). CD122, the β-chain of the IL-2/IL-15R, is critical for IL-2 and IL-15 signaling (45) and can be upregulated by T-bet expression (46). Higher expression of CD122 on Ly6C+ gp150-specific effector cells may increase their responsiveness to IL-2 and IL-15. CD62L and CCR7 are important for T cell circulation through lymph nodes and are differentially expressed on central and effector memory T cells (47-49). In this study, CD62L expression was lower on cells from infected animals compared with naive cells, and frequencies of CD62L-expressing gp150-specific CD4+ T cells were higher in the Ly6C+ population in naive cells and effector/memory cells at days 15 and 55 p.i. compared with Ly6C− cells (Fig. 5C). Therefore, differential expression of CD62L is not a postactivation feature of cell populations defined by Ly6C expression, but it exists even in the naive CD4 population. Unlike CD62L, CCR7 expression on naive CD4+ T cells was similar between Ly6C+ and Ly6C− populations (data not shown). During the memory phase, CCR7 expression was higher on the Ly6C− gp150-specific CD4+ T cells than on their Ly6C+ counterparts at day 55 p.i. (Fig. 5C), indicating that Ly6C expression was negatively associated with CCR7 at the memory stage. To assess whether Ly6C expression correlated with proliferation capacity of Ag-specific CD4+ T cells, we first measured the proliferation of Ly6C+ and Ly6C− gp150-specific effector CD4+ T cells during the primary response by EdU incorporation. MHV-68–infected gp150-transferred mice were injected at day 14 p.i. with EdU, and mice were sacrificed 16 h later. The frequencies of EdU+ cells were significantly higher in the Ly6C+gp150-specific CD4+ T cell population than in their Ly6C− counterparts (Ly6C+ versus Ly6C−, 33 versus 12%) (Fig. 6A), indicating that the Ly6C+ population proliferated more quickly. Because Ly6C+ and Ly6C− cells can interconvert, we cannot rule out the possibility that the Ly6C+ population contains cells that converted from the Ly6C− population during proliferation and vice versa. However, our previous data (Fig. 2B) indicate that ∼30% of the cells interconverted over 8 d, whereas the current experiment was conducted over a period of only 16 h.
Correlation between Ly6C expression and potential for survival and proliferation. (A) Proliferation during the primary response. Infected gp150-transferred mice were injected with EdU i.p. at day 14 p.i. Spleens were harvested 16 h later and stained with anti-CD4, anti-CD45.1, and anti-Ly6C, and EdU incorporation was detected. Representative FACS plots were gated on Ly6C+ or Ly6C− CD45.1+CD4+ T cells (left panel). Graph shows the percentage of EdU+ cells within Ly6C+ or Ly6C− CD45.1+CD4+ T cells (right panel). Data are representative of two independent experiments with six mice/experiment. (B) Secondary expansion. gp150-specific effector CD4+ T cells from infected gp150-transferred mice were sorted into Ly6C+ and Ly6C− cells at day 12 p.i. and transferred separately into naive B6 mice (3 × 104 cells/mouse). Mice were infected with MHV-68, and splenocytes were stained at day 8 p.i. Graph shows total number of donor gp150-specific effector CD4+ T cells after re-encounter with MHV-68. Data are representative of two independent experiments with 8–10 mice/group. (C) Apoptosis assay. Splenocytes were prepared from infected gp150-transferred mice at day 15 p.i. and stained with anti-CD4, anti-CD45.1, and anti-Ly6C Abs and annexin V. Representative FACS graphs were gated on Ly6C+ or Ly6C− CD45.1+CD4+ T cells (left panel). Graph shows frequency of annexin V+ cells in Ly6C+ or Ly6C− CD45.1+CD4+ T cells (right panel). Data are representative of two independent experiments with three mice/experiment. *p < 0.05, **p < 0.01, ***p < 0.001. To assess the correlation between Ly6C expression and the proliferative capacity of Ag-specific CD4+ T cells upon secondary exposure to Ag, we compared expansion by re-exposing the Ly6C+ and Ly6C− populations to MHV-68. Ly6C+ and Ly6C− gp150-specific effector cells were sorted, and Ly6C+ or Ly6C− cells were adoptively transferred separately into naive B6 mice. One day posttransfer, recipient mice were infected with MHV-68 and sacrificed at day 8 p.i. Upon secondary exposure to Ag, the gp150-specific effector CD4+ T cells proliferated rapidly, and the pool of Ly6C− cells was much larger (∼6-fold) than the pool of Ly6C+ cells (Ly6C− versus Ly6C+, 6 × 104 cells/spleen versus 1 × 104 cells/spleen) (Fig. 6B). This showed that the Ly6C− gp150-specific effector CD4+ T cell population had higher proliferative potential compared with the Ly6C+ population. These data show that Ly6C expression is positively associated with cell proliferation during the primary response, but it is inversely associated with proliferative potential upon secondary exposure to Ag. To assess whether Ly6C expression correlated with the survival capacity of Ag-specific CD4+ T cells, we measured apoptosis in Ly6C+ and Ly6C− gp150-specific effector CD4+ T cells using annexin V staining. At day 15 p.i., >40% of Ly6C+ gp150-specific effector CD4+ T cells from infected gp150-transferred mice were positive for annexin V compared with ∼20% of their Ly6C− counterparts (Fig. 6C). This indicated that the Ly6C+ gp150-specific CD4+ T cell population contained more cells undergoing apoptosis compared with the Ly6C− population. gp150-Tg mice were on the RAG−/− background; thus, we could exploit this animal model to study the contribution of Ag-specific CD4+ T cells to antiviral immunity in the absence of CD8+ T cells and B cells. Intact or CD4-depleted gp150-Tg mice were infected with MHV-68. Titers of virus in the lungs and body weight were measured. At day 15 p.i., viral titers in the lungs of CD4-depleted mice were 1600-fold higher than those of intact mice (Fig. 7A). The body weight of CD4-depleted mice decreased rapidly after day 10 p.i. (Fig. 7B, middle panel), and these mice exhibited poorer survival compared with intact mice (Fig. 7C). Despite this clear protection, all mice eventually succumbed to infection, presumably due to the lack of antiviral CD8+ T cells and the absence of an antiviral Ab response. We concluded that transgenic gp150-specific CD4+ T cells could provide relative protection from MHV-68 infection in the absence of indirect effects mediated by help to CD8+ T cells or B cells. Antiviral activity mediated by IFN-γ. Intact (RatIgG), CD4+ T cell–depleted (αCD4), and IFN-γ–blocked (αIFN-γ) gp150-Tg mice were infected with MHV-68. (A) Viral titers in lungs of infected mice at day 15 p.i. (B) Body weight change, calculated relative to original weight (before infection). (C) Endpoint for survival (75% of original weight). Data are representative of two independent experiments with four mice/group. *p < 0.05, **p < 0.01. To explore the mechanisms of CD4+ T cell–mediated protection from MHV-68 infection, we tested the role of IFN-γ. IFN-γ is considered a hallmark Th1 cytokine (16), and it plays a pivotal role in the outcome of many virus infections as inducer, regulator, and effector for both innate and adaptive antiviral responses (50, 51). To inhibit IFN-γ signaling, MHV-68–infected gp150-Tg mice were given an IFN-γ–blocking Ab. Similar to CD4 depletion, IFN-γ blockade greatly increased the viral load in the lungs, and the titer was ∼1400-fold higher than that of intact mice at day 15 p.i. (Fig. 7A). Moreover, IFN-γ blockade caused more rapid weight loss following infection (Fig. 7B, right panel), as well as poorer survival (Fig. 7C). These data demonstrate the critical role of IFN-γ for gp150-specific CD4+ T cells to control viral replication and, thereby, prolong the survival of infected mice. To explore whether Ag-specific CD4+ T cells can differentiate into cells with cytotoxic potential, we assessed the cytolytic activity of gp150-specific CD4+ T cells by performing an in vivo cytotoxicity assay. gp150 peptide-pulsed (CFSEhi) and unpulsed (CFSElo) splenocytes from B6 mice were mixed 1:1 as target cells and injected into naive or infected gp150-Tg mice (day 13 p.i.). At the time indicated, spleens were harvested, CFSE-labeled target cells were detected by flow cytometry, and the percentage of specific lysis was calculated. Compared with unpulsed target cells, the proportion of gp150-pulsed target cells decreased, and the specific lysis was ∼44% (Fig. 8A), indicating that gp150-specific CD4+ T cells had the ability to elaborate cytotoxic functions. Positive correlation between Ly6C expression and cytotoxicity. Naive B6 splenocytes were incubated or not with gp150 peptide and labeled with 3 or 0.3 μM CFSE. The gp150-pulsed (CFSEhi) and nonpulsed (CFSElo) cells were mixed at a 1:1 ratio as target cells. (A) Cytotoxic activity in vivo. Target cells were transferred to naive or infected gp150-Tg mice (at day 13 p.i.). Spleens were harvested, and CFSE-labeled target cells were analyzed by flow cytometry 20 or 40 h later. Representative FACS graphs of live target cells at 40 h (left panel) and percentage of specific lysis (right panel). Data are representative of two independent experiments with three mice/group. (B) Cytotoxic activity ex vivo. Ly6C+ and Ly6C− effector gp150-specific CD4+ T cells were sorted from splenocytes of infected gp150-transferred mice at day 13 p.i. The Ly6C+ or Ly6C− effector cells were cultured with target cells at a ratio of 6:1 for 40 h, and CFSE-labeled target cells were analyzed. Representative FACS graphs of live target cells (left panel) and percentage of specific lysis (right panel) are shown. Error bars represent SD. *p < 0.05. To determine whether Ly6C expression was associated with CD4+ CTL activity, we performed an ex vivo cytotoxicity assay. Target cells were prepared in the same way as those in the in vivo cytotoxicity assay. Ly6C+ and Ly6C− effector CD4+ T cells were FACS sorted from the splenocytes of infected gp150-transferred mice at day 13 p.i. 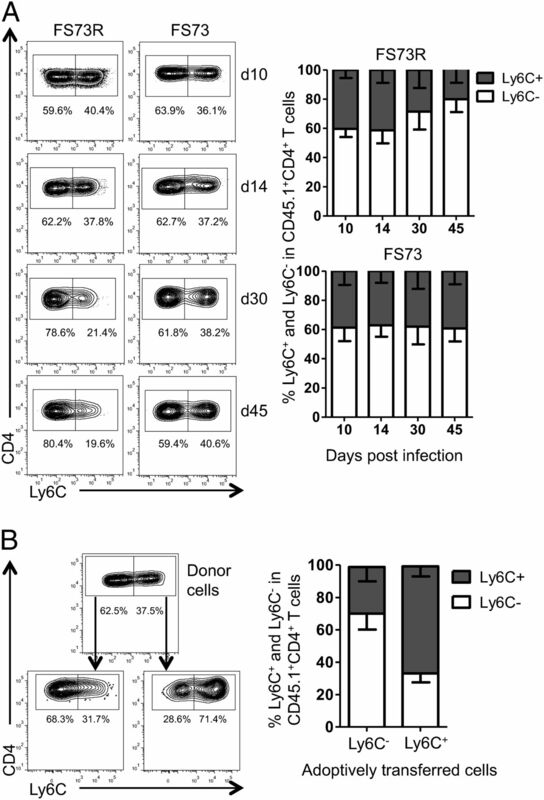 and cocultured with target cells for 40 h. Ly6C+ gp150-specific effector CD4+ T cells displayed stronger cytotoxicity, with ∼25% specific lysis, whereas their Ly6C− counterparts displayed only 7% specific lysis (Fig. 8B), indicating that Ly6C+CD4+ T cells had stronger CTL activity. gp150 was the first characterized membrane glycoprotein of MHV-68 (52), and it displays homology with EBV gp350/220 and KSHV K8.1 (35). Its expression is associated with late lytic infection (53), and gp150-deficient MHV-68 shows defective virion release but establishes normal latency (54). Although gp150 is associated with lytic infection, gp150-specfic CD4+ T cells can be activated during latency, indicating that the gp150 epitope is recognized by CD4+ T cells during periodic virus reactivation (30). gp150 is the dominant epitope of MHV-68 for recognition by CD4+ T cells, and vaccination against this protein can result in a reduction of viral titers in the lungs (55). In this study, we characterized the differentiation and function of Ag-specific CD4+ T cells, as well as their association with Ly6C expression in viral infection, using MHV-68 gp150-transgenic mice. Ly6C is expressed on monocytes, dendritic cells, neutrophils, and lymphocytes, and its function may be cell type specific (56). Ly6C on monocytes is considered a differentiation Ag: Ly6C+ monocytes show an inflammatory or immature phenotype, and Ly6C− monocytes show a resident or mature phenotype (56, 57). Ly6C is also expressed on the majority of peripheral CD8+ T cells, primarily on Ag-experienced cells (58), and supports preferential homing of CD8+ TCM cells into lymph nodes (59). In this study, MHV-68 infection triggered gp150-specific CD4+ T cells to proliferate and differentiate into Ly6C+ and Ly6C− cells in adoptively transferred mice (Fig. 2A). The gp150-specific effector CD4+ T cells expressed more T-bet than naive cells, and Ly6C+ cells expressed more T-bet than Ly6C− cells (Fig. 3A, 3B), suggesting that Ly6C expression is directly correlated with T-bet, which is in agreement with a report from the LCMV infection model (23). Additionally, a small population of gp150-specific CD4+ T cells expressed Foxp3 (Fig. 3C). These data indicate that the overwhelming majority of gp150-specific CD4+ T cells differentiate into the Th1 subset, and Ly6C expression is positively correlated with T-bet expression. In CD8+ T cells, high expression of T-bet induces SLECs, whereas low expression of T-bet promotes MPECs (43). In CD4+ T cells, T-bet was shown to associate with terminally differentiated Th1 cells (23). In this study, Ly6C expression was positively correlated with T-bet expression (Fig. 3A, 3B) and KLRG1 expression (Fig. 5A). 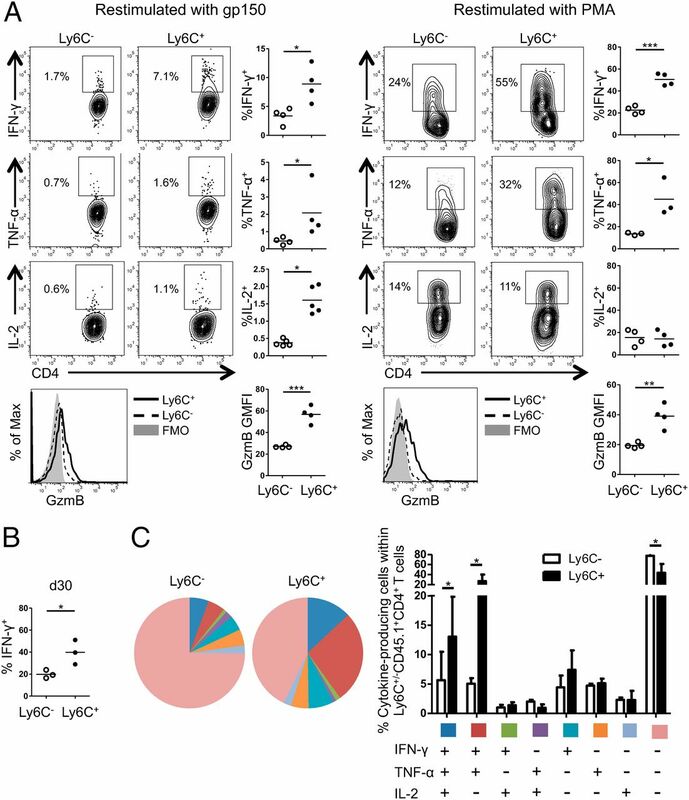 Moreover, compared with their Ly6C− counterparts, Ly6C+ cells expressed more CD122 (Fig. 5B), produced more IFN-γ, TNF-α, and GzmB (Fig. 4), proliferated more quickly (Fig. 6A), and lysed target cells more strongly (Fig. 8B), which benefits control of virus during acute infection. In contrast, Ly6C− cells displayed stronger survival potential (Fig. 6C) and more effective expansion upon secondary exposure to MHV-68 (Fig. 6B). These data demonstrate that the Ly6C+ population may contain more terminally differentiated effector cells, whereas the Ly6C− population may contain the population with an increased potential for forming memory cells. Interestingly, Ly6C+ and Ly6C− cells were not fixed in these cell fates but could interconvert in vivo upon secondary exposure to the virus (Fig. 2B), showing that both populations maintained plasticity. Our data relating to the different functional abilities of Ly6C− and Ly6C+ cells lead to similar conclusions to those reported during acute LCMV infection (23). This is important because it shows that very similar processes of CD4+ T cell differentiation take place in disparate virus infections. In comparison with data obtained from LCMV infection, the CD4 response was weaker and reached the limit of detection by ∼50 d p.i., whereas LCMV-specific memory CD4+ T cells were detectable for >150 d. This was not due to the persistent nature of MHV-68 infection, because the same pattern was seen for both the persistent FS73R and nonpersistent FS73 strains. Similarly, the differentiation profile of the CD4+ T cell response did not appear to be affected by virus persistence, except for TFH cell differentiation. One major difference between the current study and the LCMV study was the absence of a distinct PSGL1− population that was identified as TFH cells. However, in this study, we identified TFH cell populations based on CXCR5 and PD-1 expression (Fig. 3D). We noted there were more gp150-specific TFH cells after FS73R infection compared with FS73 infection. This is consistent with a previous study in which FS73 mutant MHV-68 induced fewer TFH cells among the total CD4+ T cell population compared with wild-type virus (60). Because latent infection with MHV-68 drives germinal center B cell expansion, this likely also enhances the TFH cell response, which, in turn, further supports germinal center expansion. Of note, it also was shown in the LCMV infection model that there are more TFH cells after chronic LCMV clone 13 infection compared with acute Armstrong infection (61). In this study, the investigators showed that prolonged TCR signaling was essential for the TFH cell differentiation during viral persistence. In addition, it was shown that high-affinity TCR interactions, leading to stronger TCR signaling, are important components of TFH cell differentiation (62). Therefore, the persistence of viral Ag in the FS73R-infected group may provide prolonged TCR signaling, leading to increased TFH cells. Memory T cell subsets can be identified based on cell surface markers, in particular, the expression of the lymph node–homing receptor CCR7. It was described that CCR7+CD62Lhi T cells are TCM cells, based on their ability to enter lymph nodes through high endothelial venules, whereas CCR7−CD62Lhi/lo CD4+ T cells are TEM cells because they cannot efficiently enter these sites (63). In this study, Ly6C− gp150-specific CD4+ T cells at the memory time point had higher CCR7 expression. 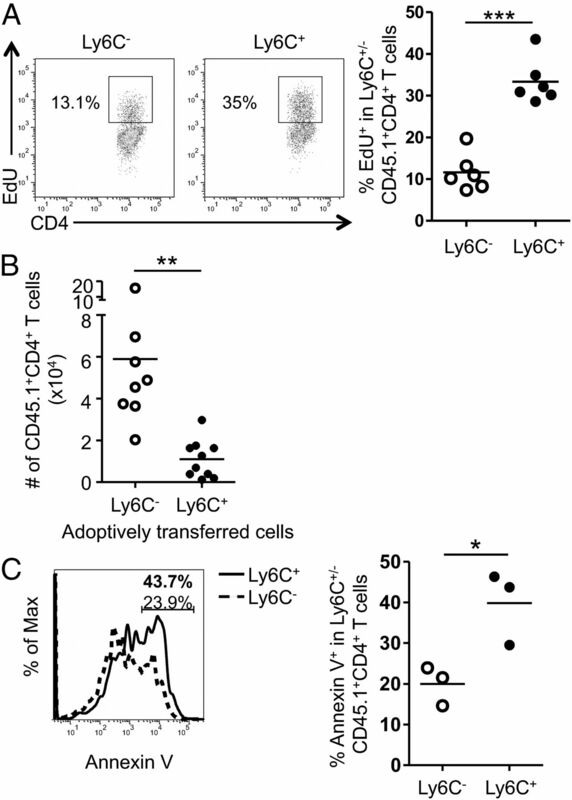 In contrast, Ly6C+ CD4+ T cells contained more CD62L-expressing cells (Fig. 5C), but even naive Ly6C+ CD4+ T cells had high expression levels of CD62L, making it problematic to use CD62L in combination with Ly6C to differentiate memory cell populations. The discordance between CD62L and CCR7 expression on memory CD4+ T cells also was reported in LCMV and L. monocytogenes infection models (64). In the current study, at day 55 p.i., the frequency of memory CD4+ T cells expressing CD62L was only 38 and 15% in the Ly6C+ and Ly6C− populations, respectively. This is consistent with a previous study in which most MHV-68–specific CD4+ T cells have a CD62Llo phenotype up to 14 mo p.i. (65). This is a similar phenotype to the MHV-68–specific CD8+ T cell response, which is dominated by CD62Llo effector memory cells (66). We also evaluated the contribution of gp150-specific CD4+ T cells to virus control independent of CD8+ T cells and B cells. Protection could not be transferred to naive mice with the small numbers of cells obtainable from infected gp150-transferred mice (data not shown); therefore, we could not evaluate the relative protective potential of Ly6C+ and Ly6C− populations. Similar to other viral systems, MHV-68–specific CD4+ T cells have a lesser direct antiviral effect than do CD8+ T cells, likely necessitating the transfer of large numbers of cells, which were not obtainable in our experimental system. However, infection of RAG−/− TCR-transgenic mice showed that gp150-specific CD4+ T cells had direct antiviral activity (Fig. 7). Although direct infection of RAG−/− TCR-transgenic mice is not physiological, this provides proof-of-principle that gp150-specific CD4+ T cells can contribute to protection. Blockade of IFN-γ signaling completely abrogated the antiviral response, indicating that CD4+ T cells function through IFN-γ in vivo (Fig. 7). This finding was surprising in light of the fact that a relatively small population of these cells produced IFN-γ in response to peptide stimulation ex vivo (Fig. 4A, left panel). Additionally, gp150-specific CD4+ T cells produced GzmB (Fig. 4A) and displayed direct cytotoxicity against Ag-pulsed cells (Fig. 8A); therefore, some gp150-specific CD4+ T cells differentiated into CTLs. Although we did not assess the relative importance of IFN-γ and cytotoxicity to viral control in vivo, the beneficial effect of CD4+ T cells was completely abrogated after IFN-γ blockade (Fig. 7), suggesting that CD4-mediated cytotoxicity may play only a minor role, at least in mice of the B6 genetic background. It is not clear whether CD4+ CTLs represent a unique CD4+ T cell subset or are part of the Th1 subset. Previous reports showed that populations of CD4+ cells were directly cytolytic in MHV-68 infection (15, 29). Several studies also showed that Th1-polarized clones have cytotoxic activity in influenza virus (67), poliovirus (68), West Nile virus (69), and EBV (70) infection models. Eomes is a critical master transcription factor for directing lytic effector differentiation of CD8+ T cells (71). Eomes expression renders CD4+ T cells cytotoxic by activating both the perforin and FasL pathways (72). In this system, we did not observe a population of gp150-specific effector CD4+ T cells expressing more eomes than naive CD4+ T cells (Fig. 3A). Therefore, further study is needed to clarify the molecular profile involved in the differentiation of CD4+ CTLs. In conclusion, phenotypically and functionally distinct subsets of effector and memory CD4+ T cells can arise from a clonal population specific for gp150. MHV-68 infection drives the majority of gp150-specific CD4+ T cells to differentiate into Th1 cells and a minority to differentiate into TFH cells or Tregs. CD4+ T cells have direct antiviral activity through provision of IFN-γ and direct cytotoxicity. Moreover, Ly6C expression on gp150-specific CD4+ T cells is correlated with a more terminally differentiated phenotype and stronger antiviral activity, but it is inversely associated with some memory cell hallmarks. Both Ly6C+ and Ly6C− gp150-specific CD4+ T cells are able to interconvert upon secondary Ag exposure in vivo, which may be of benefit to maintain a balance between the two Ag-specific CD4+ T cell populations during MHV-68 infection. These findings have significant implications for Ly6C as a surface marker to distinguish functionally distinct CD4+ T cells and define CD4+ T cell terminal differentiation. CD4+ T cells are important for controlling herpesvirus infections. Understanding the phenotype, function, and memory properties of CD4+ T cells is critical for the development of vaccines and novel antiviral therapies. This work was supported by National Institutes of Health Grants R01AI069943 and R01CA103642 (to E.J.U. ), AI42927 (to M.A.B. ), and R01CA082036 (to K.M.K.).
. 1964. Virus particles in cultured lymphoblasts from Burkitt's lymphoma. Lancet 1: 702–703.
. 1994. Identification of herpesvirus-like DNA sequences in AIDS-associated Kaposi’s sarcoma. Science 266: 1865–1869.
. 2008. Human tumor-associated viruses and new insights into the molecular mechanisms of cancer. Oncogene 27(Suppl. 2): S31–S42.
. 2009. HIV-associated lymphomas and gamma-herpesviruses. Blood 113: 1213–1224.
. 1980. Isolation of five strains of herpesviruses from two species of free living small rodents. Acta Virol. 24: 468.
. 2001. Natural history of murine γ-herpesvirus infection. Philos. Trans. R. Soc. Lond. B Biol. Sci. 356: 569–579.
. 2000. Control of gammaherpesvirus latency by latent antigen-specific CD8+ T cells. J. Exp. Med. 192: 943–952.
. 2011. Strain-dependent requirement for IFN-γ for respiratory control and immunotherapy in murine gammaherpesvirus infection. Viral Immunol. 24: 273–280.
. 1996. Progressive loss of CD8+ T cell-mediated control of a γ-herpesvirus in the absence of CD4+ T cells. J. Exp. Med. 184: 863–871.
. 2013. Regulatory CD8+ T cells associated with erosion of immune surveillance in persistent virus infection suppress in vitro and have a reversible proliferative defect. J. Immunol. 191: 312–322.
. 1999. CD4+ T cell-mediated control of a γ-herpesvirus in B cell-deficient mice is mediated by IFN-γ. Proc. Natl. Acad. Sci. USA 96: 5135–5140.
. 2009. CD4 T cells mediate killing during persistent gammaherpesvirus 68 infection. J. Virol. 83: 4700–4703.
. 2012. Expanding roles for CD4+ T cells in immunity to viruses. Nat. Rev. Immunol. 12: 136–148. 2004. Helping the CD8+ T-cell response. Nat. Rev. Immunol. 4: 595–602.
. 2013. CD4 CTL: living up to the challenge. Semin. Immunol. 25: 273–281.
. 2007. Origin of CD8+ effector and memory T cell subsets. Cell. Mol. Immunol. 4: 399–405.
. 2011. Differential expression of Ly6C and T-bet distinguish effector and memory Th1 CD4+ cell properties during viral infection. Immunity 35: 633–646.
. 1992. Murine gammaherpesvirus 68 establishes a latent infection in mouse B lymphocytes in vivo. J. Gen. Virol. 73: 3275–3279.
. 2000. Latent murine γ-herpesvirus infection is established in activated B cells, dendritic cells, and macrophages. J. Immunol. 165: 1074–1081.
. 1998. Lung epithelial cells are a major site of murine gammaherpesvirus persistence. J. Exp. Med. 187: 1941–1951.
. 2004. An optimized CD4 T-cell response can control productive and latent gammaherpesvirus infection. J. Virol. 78: 6827–6835.
. 2010. Persistent γ-herpesvirus infection induces a CD4 T cell response containing functionally distinct effector populations. J. Immunol. 184: 3850–3856. Freeman, M. L., C. E. Burkum, T. Cookenham, A. D. Roberts, K. G. Lanzer, G. E. Huston, M. K. Jensen, J. Sidney, B. Peters, J. E. Kohlmeier, et al. 2014. CD4 T cells specific for a latency-associated γ-herpesvirus epitope are polyfunctional and cytotoxic. J. Immunol. 193: 5827–5834.
. 2011. Cutting edge: activation of virus-specific CD4 T cells throughout γ-herpesvirus latency. J. Immunol. 187: 6180–6184.
. 2007. Naive CD4+ T cell frequency varies for different epitopes and predicts repertoire diversity and response magnitude. Immunity 27: 203–213.
. 2013. Development and use of TCR transgenic mice for malaria immunology research. Methods Mol. Biol. 923: 481–491.
. 1992. Virological and pathological features of mice infected with murine gamma-herpesvirus 68. J. Gen. Virol. 73: 2347–2356.
. 2003. ORF73 of murine herpesvirus-68 is critical for the establishment and maintenance of latency. J. Gen. Virol. 84: 3405–3416.
. 2008. Control of memory CD8+ T cell differentiation by CD80/CD86-CD28 costimulation and restoration by IL-2 during the recall response. J. Immunol. 180: 1148–1157.
. 2006. Gammaherpesvirus persistence alters key CD8 T-cell memory characteristics and enhances antiviral protection. J. Virol. 80: 8303–8315.
. 2011. Opposing signals from the Bcl6 transcription factor and the interleukin-2 receptor generate T helper 1 central and effector memory cells. Immunity 35: 583–595.
. 2014. Expansion of murine gammaherpesvirus latently infected B cells requires T follicular help. PLoS Pathog. 10: e1004106.
. 2001. Viral infections induce abundant numbers of senescent CD8 T cells. J. Immunol. 167: 4838–4843.
. 1993. The IL-2 receptor complex: its structure, function, and target genes. Annu. Rev. Immunol. 11: 245–268.
. 2006. T-bet concomitantly controls migration, survival, and effector functions during the development of Valpha14i NKT cells. Blood 107: 2797–2805.
. 1998. Molecular mechanisms of lymphocyte homing to peripheral lymph nodes. J. Exp. Med. 187: 205–216. 2002. Viruses and interferon: a fight for supremacy. Nat. Rev. Immunol. 2: 675–687.
. 1996. Identification and characterization of murine gammaherpesvirus 68 gp150: a virion membrane glycoprotein. J. Virol. 70: 3528–3535.
. 2003. Transcription program of murine gammaherpesvirus 68. J. Virol. 77: 10488–10503.
. 2004. Murine gammaherpesvirus 68 lacking gp150 shows defective virion release but establishes normal latency in vivo. J. Virol. 78: 5103–5112.
. 1999. T-cell vaccination alters the course of murine herpesvirus 68 infection and the establishment of viral latency in mice. J. Virol. 73: 9849–9857.
. 2013. Ly6 family proteins in neutrophil biology. J. Leukoc. Biol. 94: 585–594.
. 1997. Distribution of Ly-6C on lymphocyte subsets: I. Influence of allotype on T lymphocyte expression. J. Immunol. 158: 4211–4222.
. 2011. Ly6C supports preferential homing of central memory CD8+ T cells into lymph nodes. Eur. J. Immunol. 41: 634–644.
. 2013. Modulation of B-cell tolerance by murine gammaherpesvirus 68 infection: requirement for Orf73 viral gene expression and follicular helper T cells. Immunology 139: 197–204.
. 2009. The function of follicular helper T cells is regulated by the strength of T cell antigen receptor binding. Nat. Immunol. 10: 375–384.
. 2003. Similarities and differences in CD4+ and CD8+ effector and memory T cell generation. Nat. Immunol. 4: 835–842.
. 2013. Antigen experience shapes phenotype and function of memory Th1 cells. PLoS ONE 8: e65234.
. 1999. Quantitative analysis of the acute and long-term CD4+ T-cell response to a persistent gammaherpesvirus. J. Virol. 73: 4279–4283.
. 2004. Different functional capacities of latent and lytic antigen-specific CD8 T cells in murine gammaherpesvirus infection. J. Immunol. 172: 1213–1219.
. 1994. Influenza virus-specific CD4+ T helper type 2 T lymphocytes do not promote recovery from experimental virus infection. J. Exp. Med. 180: 1273–1282.
. 1995. Poliovirus-specific CD4+ Th1 clones with both cytotoxic and helper activity mediate protective humoral immunity against a lethal poliovirus infection in transgenic mice expressing the human poliovirus receptor. J. Exp. Med. 181: 1285–1292.
. 2008. West Nile virus-specific CD4 T cells exhibit direct antiviral cytokine secretion and cytotoxicity and are sufficient for antiviral protection. J. Immunol. 181: 8568–8575.
. 2003. Cytolytic CD4+-T-cell clones reactive to EBNA1 inhibit Epstein-Barr virus-induced B-cell proliferation. J. Virol. 77: 12088–12104.
. 2012. Ectopic expression of a T-box transcription factor, eomesodermin, renders CD4+ Th cells cytotoxic by activating both perforin- and FasL-pathways. Immunol. Lett. 144: 7–15.